Calligraphy has many origins. The Latin alphabet appeared in Rome around 600 BC and was further developed in illuminated manuscripts throughout the Middle Ages. The oldest Chinese characters date back to the Shang Dynasty and can be found on animal bones and tortoise shells. Islamic calligraphy is one of the major forms of artistic expression in many Arabic, Ottoman and Persian cultures, combining beautiful and complex designs with words from the Qur’an. Today, calligraphy is valued as a decorative means of communication and is often used to adorn invitations, letters and signs. The classic calligraphy setup is a solid handle made from wood, glass, plastic or some other hard material and a nib, the hard metal tip of the pen. Nibs are then dipped into a pot of ink and drawn across the surface of paper. Dip pens can take years to master, so it’s generally recommended to begin any exploration of calligraphy with a specialized fountain pen that combines an interchangeable nib with a refillable ink cartridge. Calligraphy markers are fairly easy to use. They combine a felt tip with an ink cartridge. Calligraphy brush pens offer the next level of difficulty by combining a natural hair or synthetic fiber brush with an ink cartridge. This article is divided into four different sections. Calligraphy fountain pens, calligraphy brush pens and calligraphy markers contain products that are designed with the beginner in mind. However, they can also be used by more experienced calligraphers who prefer a convenient “all-in-one” solution. This is particularly useful for professional cartoonists and artists. The calligraphy nibs section explores reviews for products that can be used in fountain pens or for a more traditional dip pen. We love to receive your feedback. Please tell us more about your favourite calligraphy products in the comments section below this article. Calligraphy fountain pens contain an internal reservoir of ink, which takes the form of a replaceable cartridge, that is contained within the body of the pen. The ink flows out through the metal nib and onto the paper. Most people find that this more modern style of calligraphy pen is much easier to use than the traditional dip pen. This pen was designed with the calligrapher in mind, but can also be used by any individual wanting to improve his or her handwriting. It stands up well to repeated use and is very lightweight, which was comfortable for most reviewers. Many said that the quality more than justifies the price. However, some said that the lack of a clip was an inconvenience, particularly men who are accustomed to carrying their pens inside a jacket pocket. There are a variety of nib sizes available with this pen; the fine and extra fine point nibs were preferred. 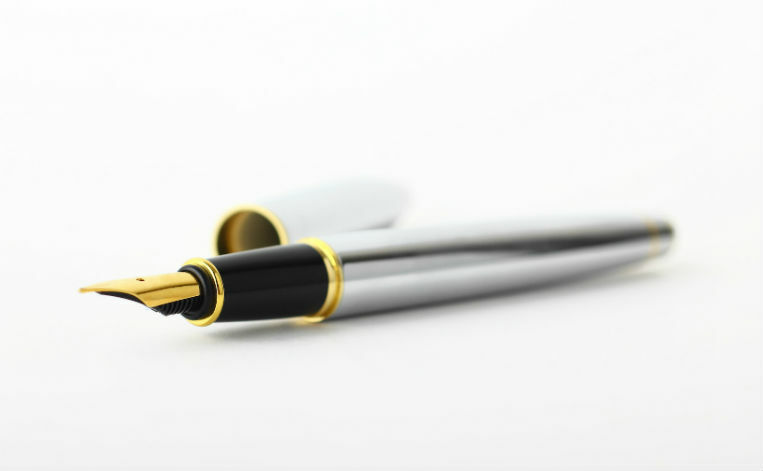 Most reviewers noted the price of this pen and said that they found it to be exceptional for the level of quality provided by the Pilot Metropolitan Collection Fountain Pen. It is heavier than many other models, giving many reviewers the impression of luxury. However, the grip is not textured and can become slippery. Also, some reviewers reported that the cap became loose after repeated use, which can increase the danger of leaked ink. This pen set comes with a pen body, multiple colour ink cartridges, a nib cleaner, a converter and a detailed instruction book, all packaged in a convenient plastic carrying case. Additional colours and nibs are sold separately, providing the owner of this pen with a wide range of available styles. Some reviewers noted that the cartridges can be difficult to change and that the ink runs out quickly, requiring frequent changes. However, most were pleased with the overall quality and versatility of this set. The reviews for the Luxury Jinhao 250 Calligraphy Fountain Pen are somewhat mixed. Some liked the thick barrel and heavy weight of the pen, while others found that it was too much. It appears to be an issue of hand size. Many reviewers agreed that the pen provides a good level of quality for the price. The included nib is disappointing, but can easily be replaced. A twist-off cap reduces the risk of an ink leak, which is common when the “pop-off” lids become loose over time. This pen is recommended for beginners because of its relatively cheap price and compatibility with various nib sizes, making it easy to experiment with different styles. However, more experienced calligraphers may find themselves disappointed by the cheap plastic construction and the way that it bleeds through most papers. Though most reviewers were pleased with the overall performance, there were several who said that they had problems with leakage and the consistency of their lines when using this pen. Reviewers liked this pen because of its long barrel, which is very aesthetically striking and comfortable for larger hands. The model is also quite reliable with no reports of leaks or bleed-through from the hundreds of reviews that we considered. One negative aspect of the Lamy Joy L1 ABS Calligraphy Fountain Pen is that fingerprints are conspicuous on the pen’s black barrel. However, this is more of an annoyance than a defect. Reviewers were also not pleased with the quality of nib offered by the manufacturer, but it can be easily replaced. The Kaweco Sport Classic Fountain Pen is recommended for children and individuals with small hands because its body size is unusually short. Calligraphers with larger hands found it difficult to use and some complained about the lack of a clip, which makes carrying the pen in a coat pocket more difficult. The pen is very lightweight because of its plastic construction (perhaps the justification for the “sport” appellation?) and is quite affordable for the beginner or the more experienced calligrapher on a budget. The most common complaint about the Rotring ArtPen is that the nib sizes are inconsistent with the sizes offered by many competitors, making it more difficult, particularly for the beginner, to know which size to use for broad or fine strokes. Additionally, the pen nibs do not support waterproof ink and there were some issues reported of the ink not flowing consistently. On the plus side, the cartridges are quite easy to change. The pen has a strong clip, which means that it can easily be carried in a jacket pocket, and the price is comfortable. This set of four pens, five nibs and 20 ink cartridges is a great “grab-and-go” solution for someone who is interested in experimenting with the art of calligraphy, particularly because the price is so accessible. However, experienced calligraphers were not pleased by the ink flow and the cheap plastic construction of the pens. There were many complaints about pens that dried up quickly and lines of inconsistent thickness. Better pens are available, but the price is hard to beat. Calligraphy nibs are most often used in combination with a handle made of wood or plastic to create a dip pen. The nib refers to the metal tip that is dipped into a small jar of liquid ink. The amount of ink that the nib can hold and the width of the lines that it can produce depends on its size and design. Skilled calligraphers can also control line width by applying varying degrees of pressure with the hand. This set of six nibs also includes a plastic handle for the dip pen method of calligraphy. They are rated well as a tool for beginners because they are flexible and produce smooth and even strokes. The price is also not too extravagant for someone who is new to calligraphy. They are not a top-of-the-line product, but they do offer a nice quality for the price. The nibs do have to be removed and cleaned after each use to preserve them. Otherwise, they will disintegrate and eventually snap. This is fairly normal and regular nib cleaning should be a part of any calligrapher’s routine. According to many reviewers, this nib is notable for its flexibility. It can create very fine lines with the tip or be splayed out to create wider lines with only the slightest pressure from the calligrapher’s hand. Application is generally quite smooth, but some said that the ink release can be too fast, causing it to “blob” and sometimes bleed through the paper. Also, because the nib is fairly small, it does need to be re-inked often. This nib is quite small and best suited to making very fine, delicate lines. It does not hold a lot of ink, but it does have a nice consistent flow. The tip is flexible, which provides some versatility, but is not recommended for the heavy-handed artist, because it can break quite easily. Reviewers said that it does not work well with thicker inks and noted that it does require extra time for the flow of ink to start, requiring some patience. It is not an ideal choice for the beginner. This nib might be a good choice if you tend to press down on the tip with quite a heavy hand. Though it is quite responsive, it is not as sensitive as some other brands. It is quite small, but holds a fair amount of ink. It’s also possible to create a wide range of line thicknesses. The major downfall is that it does not apply ink as smoothly as some competitor’s nibs. The tip tends to “scratch” the surface of even very fine papers. This nib is the top choice for many professionals. It is stiffer than some other models, but it offers a lot of flexibility in terms of line thickness. It does not scratch and the ink flows well across a wide variety of papers, even cheap notebook paper. Zebra G Nibs are most frequently sold in a package of 10 nibs and require preparation before use. Each nib has a wax tip to protect it from rust that needs to be burned off before it can be dipped in ink. This is standard for high-end nibs, but may be a complicated extra step for inexperienced calligraphers. This is another top-of-the-line product. Nikko G Nibs are also a bit stiffer than some of the other brands, even stiffer than Zebra G Nibs, requiring more hand pressure to change the width of a line. However, this aspect does provide the calligrapher with more control, which may be appealing to beginners. Some reviewers noted that the ink dries much quicker on the nib, which means that it has to be re-inked more frequently than some other models. For every reviewer who stated that the William Mitchell Calligraphy Nibs are not well-suited to beginners, another reviewer claimed that they are. This would lead us to the conclusion that the flexibility of the nib is more of a personal preference than a preference based on the user's level of experience. Calligraphers who like a very flexible nib will be comfortable with this product. Based on reviews, they will also be pleased with the ratio between quality and price. It was noted, however, that the William Mitchell Calligraphy Nibs may require some filing before use, so as not to catch and tear the paper. Calligraphy brush pens follow the same principle as the calligraphy fountain pens with an internal reservoir of ink. The main difference is that the tip of the pen is a brush made of natural or synthetic hair, rather than a metal nib. For those who would like to practice the ancient art of brush calligraphy, calligraphy brush pens offer a great training tool. This product offers two different brush sizes in one convenient, double-sided pen. The medium brush end holds quite a lot of ink and is praised for its consistent flow. The fine point brush end is perfect for delicate detail work. Reviewers noted that this pen does not create a lot of bleed-through the paper and is lightweight, which makes it much more comfortable and easy to use. Unfortunately, the pen ink is not refillable. Also, the brush tips, particularly the tip of the medium brush, are prone to fraying when they become dry. This pen is unique because it is made with genuine sable hair. A sable is an animal from the weasel family that is prized for the softness of its hair, which is often used to make paintbrushes. Most calligraphy brushes are made with synthetic, imitation fibers. Reviewers generally believe that the natural hair provides a more consistent flow of ink. However, special care must be taken to ensure that the hair is not damaged. Waterproof inks should not be used with this brush. Also, the included oil cap should be placed on the brush in between uses to condition and protect the brush. This product is sold in a nice wooden box with several replacement ink cartridges. This is one of the most popular calligraphy pens currently available on the market. Though it is not recommended for beginners, more experienced calligraphers like it because it does not bleed through the paper and provides a good value. The pen and ink cartridges are also refillable, offering a wide range of customizable options. It does take some time for the ink to begin flowing out of the pen, so patience and practice are required. These brush pens are sold as a set of six or individually in nine different colours. Some reviewers said that the range of colours is very complementary to that offered by other brands. The tips are very fine, allowing for delicate lines and detail work. Also, these pens bleed through less than many other markers available on the market. However, because the tips are so fine, these markers can be somewhat challenging to control, particularly for the beginning calligrapher. They also do not stand up well over time and have to be replaced with some frequency. Calligraphy markers also have an internal reservoir of ink, but with an angled tip made of felt. According to many reviewers, they are the easiest calligraphy tool available. Unlike calligraphy fountain pens, dip pens and brush pens, the width of the lines created with calligraphy markers are not as sensitive to hand pressure, allowing the beginner to experiment with different styles of writing. This marker is recommended for beginners because it is easy to use, but more advanced calligraphers might be disappointed by its felt tip, which frays easily. It also does not make very crisp lines, unless the user presses down with some force, which can fatigue the hand over time. However, the price is quite low and the pen is double-sided, offering double value to the individual who is new to calligraphy and just wants a simple way to begin hand-lettering. These markers can be used for writing and basic calligraphy. According to several reviewers, they also achieve beautiful effects when they are mixed with water. This level of versatility makes the Speedball Elegant Writer Calligraphy Markers an ideal choice for someone who wants to experiment with the various possibilities offered by calligraphy markers. However, there were some complaints about the markers drying out quickly, which could suggest that this brand does not offer a lot of value in terms of quality. This set of calligraphy markers comes with five different colours and a fine tip on each end of the marker. Some reviewers said that they would prefer to have more colours, but were generally pleased with the colour saturation. The markers do not bleed through the paper, but they also do not smudge. As with all markers, they are a bit drier than brush and ink calligraphy sets, but can provide an excellent entry point for beginners. This set of double-sided calligraphy markers comes in a convenient plastic carrying case with 48 different colours. Though significantly more expensive than the other products in this category, the wider range of colours makes it a worthy investment for illustrators, scrapbookers and even the casual doodler. According to reviewers, the thinner of the two tips can sometimes become brittle and dry. Also, some felt there are a number of colours, which are too light to be considered useful. In this section, we highlight the best products from each of the four categories included in this article. We are not connected to any of the brands mentioned and base our conclusions exclusively on the reviews and feedback provided by individuals who have purchased and used these calligraphy pens and nibs. From the calligraphy fountain pens category, the Pilot Parallel Calligraphy Pens offers the best overall quality for the price with a wide range of extras. The Lamy Joy L15 ABS Calligraphy Fountain Pen is a very reliable pen, but better suited to calligraphers with large hands because of its long barrel. Calligraphers with smaller hands might prefer the shorter Kaweco Sport Classic Fountain Pen, which is also quite lightweight. Calligraphers who practice the dip pen technique will prefer Zebra G-Nib if flexibility is a priority. Beginners might have more luck with Nikko G Nib, which offers the same level of quality, but is stiffer, providing more control over line width. The Pentel Arts Pocket Brush Pen is a top choice for professional illustrators but might frustrate beginners because of its slow start time. The Zig Memory System Twin Tip Calligraphy Markers are best for someone new to calligraphy or for the casual hobbyist because they offer an extensive range of colours and are generally easier to handle. Tell us about your calligraphy tools and techniques in the comments section below.